As you face daily choices that require yes or no decisions, there are times when you feel paralyzed -- either from fear of making the wrong choice or because of too many seemingly equal options. 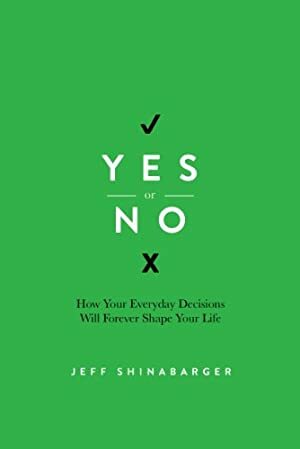 Social entrepreneur Jeff Shinabarger helps you break through these moments of tension and transition with proven ways to move toward good choices. Jeff Shinabarger is a social entrepreneur and the author of More or Less. Jeff has a vision to make Atlanta a center for social innovation and has personally engaged in over 100 start-ups solving problems. His work has been featured by CNN, USA Weekend, Atlanta Journal Constitution, Huffington Post, Christianity Today, Coca-Cola, Relevant Magazine, and Chicago Sun Times. He is the co-founder of Q and creatively led Catalyst for eight years. Jeff and his wife, Andre, live in East Atlanta Village and have two children. Log In to track Jeff Shinabarger on eReaderIQ. to be notified each time the price drops on any book by Jeff Shinabarger. to stop tracking Jeff Shinabarger. We started tracking this book on June 12, 2014. The price of this book has changed 71 times in the past 1,775 days. The current price of this book is $9.21 last checked 49 minutes ago. The lowest price to date was FREE last reached on April 23, 2015. The highest price to date was $15.99 last reached on April 27, 2017. We last verified the price of this book about 49 minutes ago. At that time, the price was $9.21. This price is subject to change. The price displayed on the Amazon.com website at the time of purchase is the price you will pay for this book. Please confirm the price before making any purchases.